Spanning a century and a continent, these romantic novellas will lead you on a journey through the landscape of love. Four young women find their lives altered after each receives a letter that sets her on a new path. From a Hudson River steamboat to a lush drawing room, from a carousel carver's workshop to a remote hospital, you'll be swept into the lives of women who are making their way in the world and finding love where they least expect it. Lorraine Caldwell will lose her family fortune to a reckless cousin if she doesn't marry quickly. When she learns her long-lost brother is alive, she hopes she's found the answer to her problems. What she finds instead is a mysterious carousel carver who turns her life upside down. Grace Hathaway must rescue a dear friend from a remote and notorious clinic that promises healing but delivers only heartache. In a place laced with deceit, where lives hang in the balance, whom can she trust to help her? Where to start? I honestly can't say enough good about this book. I loved every single story in it and when I closed the final pages, I was left wishing there was just one more story. The characters are real and they're relatable, no matter which author is behind them. You spend every page cheering them on or shaking your head at whatever they've gotten up to now. They're brave in ways that you and I could only imagine being. Seriously, run, don't walk and get yourself a copy of this book. One last bit... I just got word that Jane Kirkpatrick is offering a giveaway over at her site! Head on over and check it out! I received a copy of this book for the sole purpose of this review. All thoughts, comments and opinions are strictly my own. 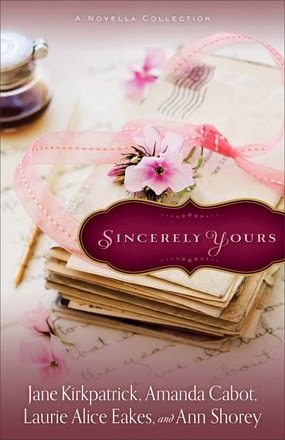 Katie -- Thanks so much for taking the time to read and review Sincerely Yours. I'm delighted that you enjoyed our stories. I'm late reading your lovely review, but I "sincerely" thank you for reviewing Sincerely Yours. So glad you enjoyed our stories!